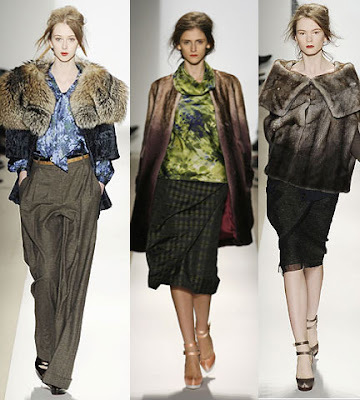 I just saw Peter's new collection for his fall-winter 2010, it's simply beautiful! After all the trouble in the past year his company went through, I am so glad he has finally making a successful come-back, a fabulous one I might add! I was fortunate to attended Parsons School of Design NYC for my college education and met lots of super talented friends and Peter was one of them. His clean, subtle luxe & all American chic style has set him apart from most of us both back in college at Parsons and now in the design world. Besides his undeniable talent and taste for fashion, he is also a person with a lot of wit, humor, easy going and simply a great person to be calling a friend. 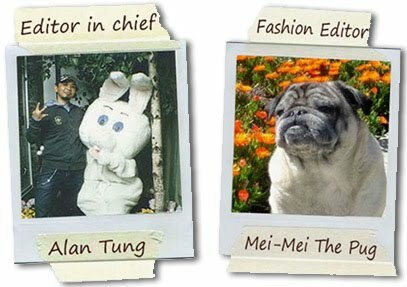 I've seen Peter's very first collection starting back in year 2001, besides his undeniable talent & hard work, he has also being able to stay focus on his vision for each collections. Year after year, you can always count on Peter to give us the kinda uptown glam - downtown cool, effortless chic designer clothes you can actually wears in the modern daily lives! People often compare him to be "The next Michael Kors", but to me, he has his own very own unique taste and look that no one has! As we all know, to achieve what Peter does, become a house hold name as a young designer that has all the fashion magazine editors such as the Queen of American fashion - Chief Editor of Vogue Magazine Anna Wintour who loves Peter's most recent Spring Summer 2012 collection and having the A-List Celebrities wanting to wear his creations is very tall order to achieve! But Peter has done it with persistence, drive and believing in his vision. 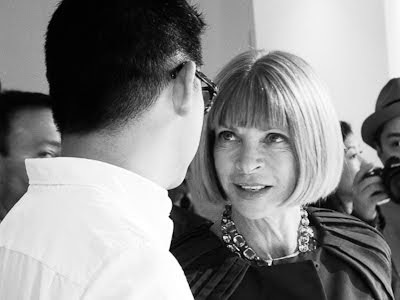 An amazing moments when young, uber-talented designer Peter Som, suddenly realized that the final word in NY fashion, Anna Wintour, actually loves his collection. A picture is worth a 1000 words. Fashion is like the show business in Hollywood, both are selling "Dreams" & "Fantasies". Each season, designers dazzle us with their creative visions and beautiful collections all over the world, but when the reality of the world wide economy downturn sets in, every designers are effected by it and it has impacted Peter Some starting early 2009. Peter has had a bumpy ride over the years including losing financial backing. 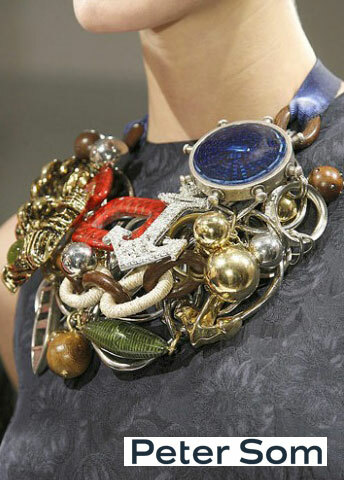 But his Spring/Summer 2010 collection, is reinstating his place as an accomplished and talented designer. He showed his collection at MAC & Milk Studios this year as an installation show, where those with invitations were allowed to come in and peruse the collection as you would in an art gallery. The models stood on a runway broken into three parts and posed for photos as guests sipped cocktails and water, chatted with Som as he strolled through the crowd and talked about the amazing collection. Peter took his inspirations—Lartigue's iconic photos of twenties-era Deauville, Hokusai's woodcuts, classic cruisewear—and wove them together with a sort of madcap thread. The mixture of colour and textures sets Peter Som’s collection apart from many others. mixing stripey tweeds with all manner of prints and off-kilter fabrics, like a turquoise leopard jacquard. He kept his silhouettes soigné but found ways to give his classic uptown standards a whimsical tweak.. For Som it was all about "season less dressing" and each piece is a very special by itself, to me, it's a very smart move because each piece is a "Must Have" piece that you can add to and mix with pieces you already have in your closet. I think that this thinking could be the way forward especially in these recession times. Peter Som is definitely one to watch. As they say what doesn't kill you only makes you stronger. Even with the troubling year, It did not seem like Peter Som held back on quality even though it was all out of pocket. Most designers rely on a certain financial backing in regards to releasing a line each season- Which can include up to 4 collections each year... but Peter Som still offers up a collection that was a collective of Mix Matched texture and color in Undeniable Som style. While Peter may have left his past with legendary American fashion house Bill Blass behind him, but with the many opportunities such as possibily be the head designer for Tommy Hilfiger & his new jewelry collections in the horizon, we'll see more of him & his creations in the future. All I have to say is his Spring-Summer 2010 collection was a breath of fresh air and should turn even the most jaded, black-loving urbanite fashionistas into an optimistic pattern mixing master in the coming spring! As the year of 2009 is marching to the end ( yes 3 more months till the holiday season, the "happiest time of the year" haha) with the bright, colorful, sparkly collections Peter just shown in NYC, we hope all the bad news are behind you Peter! and we're all rooting for you! Keep dazzel us with your beautiful designs! Untill next time, go shopping! support our fashion industry & designers! If you like to check out Peter Som's fabulous collections, you can find it at Neiman Marcus, Bergdorf Goodman, Nordstrom and many other stores (Click here to see the list of stores that carry Peter's collection). Click on the media player below to see a behind the scene of his Fall-Winter 2008 Collection, how the models come for fittings, make-up & hair all the fun stuff of the exciting New York Fashion Week! Come back to check out our blog again and see what "Must Have" & "Fabulous" item & things we found!